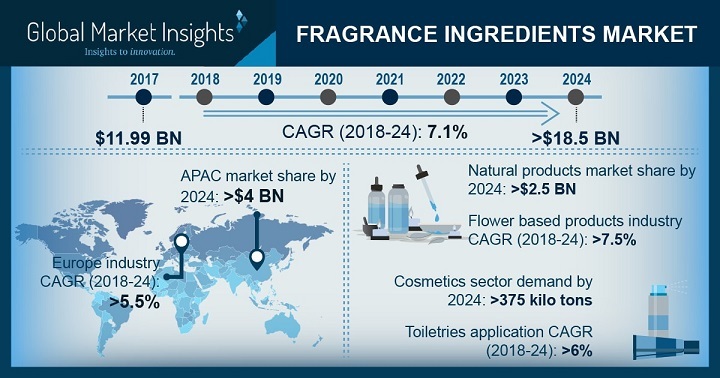 Fragrance Ingredients Market size is set to surpass USD 18.5 billion by 2024; according to a new research report by Global Market Insights, Inc. Growing penetration rate of international brands, rising demand for personal care products along with growth in cosmetics industry will drive overall fragrance ingredients market demand. These compounds are mixed with personal care products to improve aroma and give freshness to a product. Growing customer spending on beauty products including creams and perfumes supported by growing ageing population may boost industry growth. Advantageous government policies regarding use of natural ingredients along with strong R&D assistance on ingredients production is likely to promote product demand. Additionally, supportive governing amendments by European Union related to the use safe chemicals in the region may act as crucial contributing aspect towards the growth of fragrance ingredients market. Global fragrance ingredients market size from soaps & detergents application is estimated to reach 500 kilo tons by 2024. Synthetic products including aldehydes, alcohols and esters has extensive use in household and industrial detergents used for dish washing, clothes washing, hair and body washing, and hard surface cleaning, which is likely to stimulate product demand. New product formulations and demand for herbal and organic ingredients in personal care products is projected to drive the regional fragrance ingredients market over forecast timeframe. Expanding economic standards along with growing awareness about grooming and personal hygiene are likely to boost market growth. Global fragrance ingredients market size from wood-based application is poised to exceed USD 750 million by 2024. These products provide warmth and depth aroma along with natural sensuality. Woody element in the product gives long lasting and musky smell, which may favor product demand. Fragrance ingredients manufacturers are replacing synthetic constituents with effective and safer product like fruits, flower and spice. Although, price of substitutes is reasonably higher, consumers are prepared to spend extra on non-toxic products, thus propelling industry growth. High cost of natural ingredients owing to capital intensive production process may distress fragrance ingredients market price trends. Severe regulatory standards pertaining to use of synthetic chemicals may incur additional compliance cost, thus affecting industry profitability. Germany alcohols-based fragrance ingredients market size is likely to reach 30 kilo tons owing to its usage in anti-aging cremes, shampoos and sunscreen lotions and conditioners. These products have similar features as natural products due to high effectiveness and its application in wide range of perfume products is likely to enhance product demand. China fragrance ingredients market demand from toiletries application may witness significant growth of over 6% in projected timeline. Growing living standard of consumers along with making these products more presentable will boost overall market for fragrance ingredients in this region.